The Power Access automatic door opener gives complete independence to enter and exit a residential building using the Model 2300, or public/ light commercial application using the Power Access Model 4300. 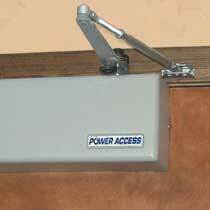 This professional grade access system unlatches a locked door, then opens, pauses and closes it automatically. Remote controlled door openers can be operated with a variety of wall push pad, handheld push button, key fob, wheelchair mounted, or even smart phone remote controls to accommodate most individual needs. Visit the Power Access website for more information.